Kukharenkoite-(Ce) is a barium cerium fluoride carbonate mineral, formula Ba2CeF(CO3)3. 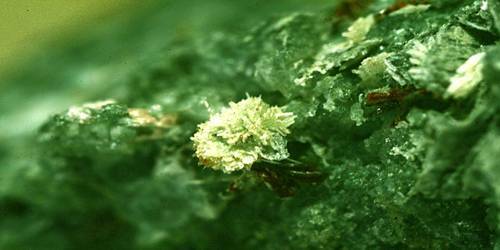 It was identified from samples found in the Mont-Saint-Hilaire alkaline intrusive complex, Quebec, and the Khibiny Massif, Kola Peninsula, Russia. It was named for Russian mineralogist Alexander A. Kukharenko (1914–1993). 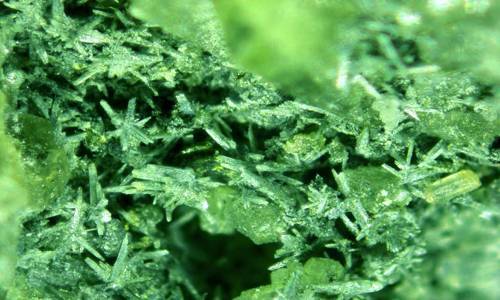 Type Locality: Khibina and Vuorijärvi massifs, Russia; Mt St-Hilaire and St-Amable, Canada. The similar zhonghuacerite, a cerium-containing mineral from China, is considered to be either Kukharenkoite-(Ce) or huanghoite-(Ce) rather than a valid mineral. Color: Yellow, Reddish brown, Colorless, White, Pinkish gray. Occurrence: In syenitic alkalic massifs and carbonatites. Association: Belovite-(Ce), Ancylite-(Ce), cebaite-(Ce), cordylite-(Ce), synchysite-(Ce), mckelveyite-(Y), ewaldite, rinkite, zakharovite, nenadkevichite, yofortierite, l˚avenite, burbankite, calcite, barite, fluorapatite, fluorite. Distribution: In Russia, from Tuliylukht Bay and the Kirov apatite mine, Mt. Kukisvumchorr, Khibiny massif, and at the Vuoriyarvi carbonatite complex, Kola Peninsula. In the Bayan Obo Fe–Nb–Re deposit, 130 km north of Baotou, Inner Mongolia, China. At Mont Saint-Hilaire, and from near Saint-Amable, Quebec, Canada.